Get ready for Liverpool International Music Festival 2019 as it heads back to the stunning Sefton Park for another weekend of unforgettable music. On 20-21 July, the stage will be set once again to bring global household names alongside the most exciting emerging new talent that LIMF is renowned for. Headlining the Saturday is an exclusive live performance celebrating legendary label 3Beat Records’ 30th Birthday. The much loved home grown music institution will celebrate its 30 years of greatness with a show featuring over 30 musicians performing the label’s biggest hits, with special guests including platinum-selling SIGMA, British-German DJ duo M-22, Liverpool-born house producer Anton Powers, amongst others. The unmissable live experience that is Disco Classical, with Special Guest Sister Sledge featuring Kathy Sledge will headline on the Sunday and is heralded as one the most memorable and uplifting live music experiences around. Lovers of disco are in for a once-in-a-lifetime treat, when a collection of the world’s greatest tracks including ‘We Are Family’ and ‘He’s The Greatest Dancer’ are re-imagined, reinvented and brought to the stage with the help of Manchester Camerata Orchestra, a live band and renowned crowd-pleaser DJ Mark Armstrong. Hip-hop pioneers and living legends, De La Soul will also make an appearance as part of the festival’s eclectic offering. With a mix of irreverent lyrics, social commentary and jazz-funk sampling their impressive set is sure to entertain the crowds. Chart-topping force Ella Eyre joins the lineup too, alongside MOBO and Brit-nominated singer-songwriter NAO, breakthrough rapper and singer Yxng Bane, and DJ and producer SG Lewis, whose electronic stylings have earned praise from Justin Timberlake and Pharrell. The incredible Maverick Sabre is also coming to Sefton Park alongside Liverpool R&B collective MiC LOWRY, four-time Grammy-nominated DJ and producer, Kenny Dope and electrifying sets from De La Soul’s DJ Maseo, Norman Jay MBE and BBC Radio 1Xtra’s Jamz Supernova. 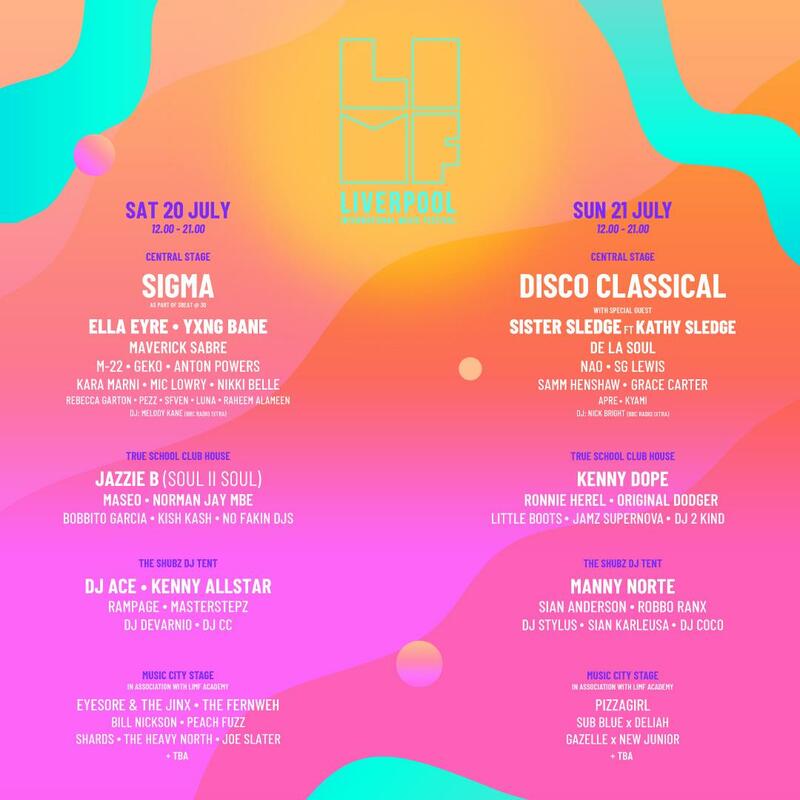 LIMF Academy artists will perform across a number of stages including rising star of the electronic pop scene LUNA, singer-songwriter Raheem Alameen, contemporary R&B musician KYAMI, as well acclaimed Liverpool bands and artists Eyesore & The Jinx, Bill Nickson and Pizzagirl. Tickets to LIMF 2019 cost £6 per person* and VIP tickets are £21*. Children aged 12 and under go FREE!